Little brother emailed me the following interview. Basically, Piers Morgan, a British TV show host/ TV journalist in America, has used his television platform to speak out against the high numbers of Americans holding and owning rifles in their homes and on their person. He’s a diplomatic figure in the media, with a reputable position as a fair and honest journalist. 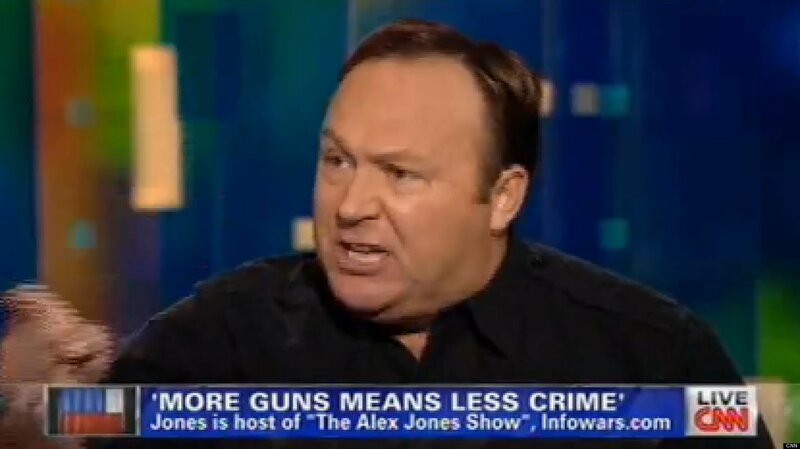 Since honestly admitting his position against guns in the USA- a position that many Americans share- a group of people led by Alex Jones have claimed that Piers is attacking the 2nd Amendment and should therefore be deported from the United States, and sent back to Britain. I try not to speak out too often on heated political debates; I should think those who know me will know that my British-ism speaks for itself when presented with most of these debates. I will say, however, that Jones’ behavior, and I would also say the behavior of this group of people he is leading, is far from admirable as a collective group of Americans. To suggest deporting one who exercises their right as a tax paying visitor to the United States to speak freely: this is preposterous and exclusionary. To scream and shout is tasteless and shows little poise. To mock one’s accent in a derogatory and spiteful manner is, frankly, racist. His fiery interjections, personal attacks on one British man, and misbehaviour in general does little to support or portray fairly the American personality, or simply the other side to Piers’s debate. I had to watch each part twice to understand his point because I spent the first round trying to recover from an uneasy awkward feeling as a viewer. I am a firm believer in diplomacy and tactfulness in rhetoric. Jone’s may have very good points- but they are lost in anger and a raised voice. I might agree with him wholeheartedly- but my dislike of his character would be enough for me to sign a petition to make Piers King of the USA. It’s a ridiculous concept, yes. But it hinges on one very important point. Jones’ arguments lacked something very human. He wasn’t there to reach understanding with Piers: he was there to fight. When it comes down to it, guns don’t kill people; people kill people. Angry, aggressive people, most usually. It is a shame that in the light of so many recent tragedies, people like Jones would spend their time inventing ludicrous deportation petitions, or thinking up 101 analogies that involve chimpanze’s, rather than reaching out to find a solution to a very serious problem. Piers could be wrong: but his black and white British brain suggests simply: less guns, less gun violence. It’s logical. It works in many other countries in the world including my own. Jones’ reluctance to not even consider the option is incredibly disappointing and makes me wonder why? Is it that he has such little faith in American law protective services? Or is he really hoping to keep his Saturday hunting trips with the boys alive? I think he forgets that the 2nd Amendment is exactly that: an amendment to an original concept or design. As times change and society progresses, hundreds of years old designs should be amended and changed to better serve and protect its people. Maybe it’s time that a change was made- if not legally, then at least in the general manners and etiquette of the general public. actually knows what they are discussing online. You actually realize how to bring a problem to light and make it important. I saw your post a few days ago and I was really annoyed too! I feel like, even if I agreed with this guy’s point, I would never be able to tell because he presents himself in such an absurd way. He makes anyone who might disagree with Morgan look like a lunatic! I understand there is a lot of emotion in this argument on both sides and I can appreciate that. But I get totally turned off by the disrespect shown in this video. This is exactly why people hate politics. I’ve been watching Piers Morgan on this issue as he has been very vocal. He argues differently, but I think he is also manipulative about it. He is certainly calmer though, and I respect that. The thing to me about the US constitution is that it’s founded on principles that are unchanging. Amending things is all good and fine, that’s why the option to do so is included in the document. The thing that is so frustrating to me about the whole “2nd amendment debate” is that everyone seems to be so emotional about it and totally missing the point. It was included as a last measure of protection for citizens against a tyrannical government. It’s not about hunting or self-defense by an intruder in your home. I think this whole issue is very interesting and I appreciated seeing this video of Ben Shapiro – he much better represents the position of American’s who are in favour of keeping gun laws the same. I’m English so I think by that very fact I don’t really understand the need for guns; but I can respect someone who tries to explain his point without being insulting or demeaning! Thanks for posting this.